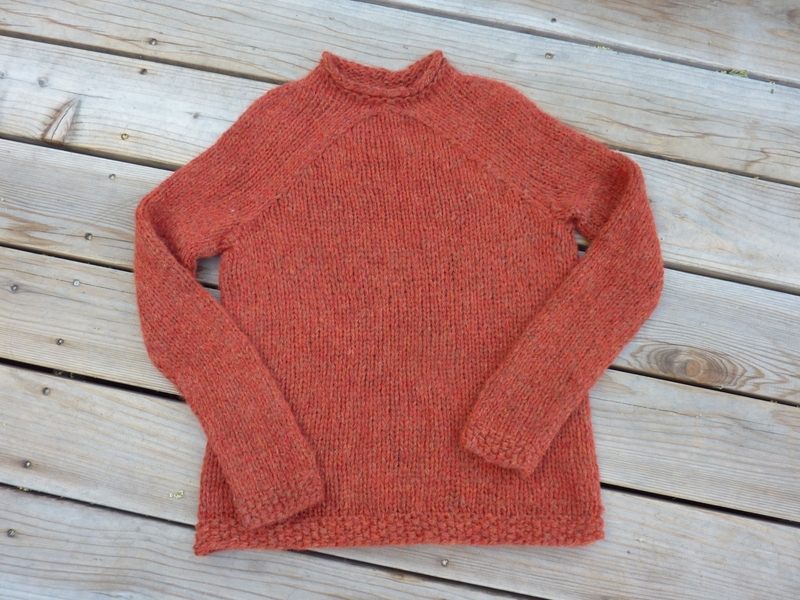 Ever since I first read Elizabeth Zimmermann’s Knitter’s Almanac, I’ve wanted to make the “Hurry-Up Last Minute Sweater”, AKA the “Wishbone Sweater“. At first it was because I hadn’t knit many sweaters, and the idea of one that didn’t take a long time to make was appealing. Then as I made more of EZ’s patterns, I came to appreciate her genius and unique approach to pattern designs. Eventually I set aside the idea. I wasn’t sure I wanted to wear such a bulky sweater, thinking it would be hot and heavy. I hadn’t seen many pictures of finished projects, and wasn’t even sure it would be flattering on me. I thought it might be better suited for men, with their broader shoulders. But I finally did make a few bulky sweaters, and they weren’t nearly as hot as I thought they’d be. When Garnstudio came out with some new DROPS aran– and bulky-weight “blown” yarns that are lighter in weight than conventional yarn of the same thickness, I thought they might be nice to try out. They’re mostly alpaca, with a bit of merino and nylon. I don’t normally like to wear alpaca, because I find it rather prickly. But for some reason, I don’t have that problem with the DROPS yarn – it just feels nice and soft. When all of their alpaca yarn went on sale last month for 35% off, I decided to buy some and try it out. I purchased some of the super-bulky (Cloud) as well as aran-weight (Air), planning to use the Cloud for this sweater, as it is listed as the correct gauge. But after doing some swatching and looking at another project I wanted to make, I decided to use the Cloud for the second project. Fortunately, using Air doubled gave me the same gauge as Cloud, so I was good to go. And the result? I love it. I’m sorry it took me so long to get around to making this pattern, but maybe it was just waiting for the right yarn. It’s soft, drapy, and cozy – the kind of sweater you can just live in. I love the wishbone yoke, and find it much more flattering on me than raglans, despite the similarity of the diagonal lines. Of course, the week I finished it we were having record-breaking heat, near 100. I’m sad that I won’t be able to wear it for months. While making the sweater, I re-discovered the genius of EZ. Aside from the wishbone shaping of the yoke, there are decreases at the shoulders that provide a more natural shoulder shape than you get with traditional raglan shaping. You can see the shoulders in the photo below. That’s not due to any blocking, it’s just the way the decreases make the shape. EZ said not to try to knit the sweater at a smaller gauge, because it doesn’t work, but only mentions stitch gauge and not row gauge. But row gauge is also critical in order to have the diagonal lines meet at the throat in the right amount of decreases. I estimated that it needs to be about 16 rows over 4″ (4 rows per inch). If you have fewer rows per inch, the yoke may be too tall by the time lines meet, and if you have more, the lines will meet too soon. But you can also do the decreases a little more quickly or slowly to make up for differences. Having too deep a yoke seemed to be more common a problem than not deep enough, maybe because some people were using such large needles, which would give them fewer rows per inch. If you need needles larger than 11 to get stitch gauge, consider that carefully. Want more inspiration? Cheryl Oberle made a darling tunic version of it. 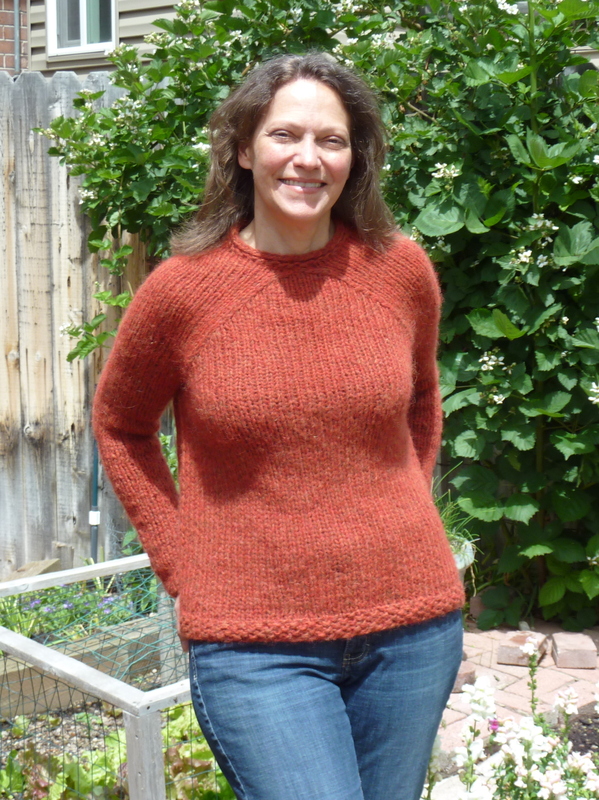 This entry was posted in Uncategorized and tagged Elizabeth Zimmermann, FO, knitting, sweater. Bookmark the permalink. Great sweater and I love that color, too. Don’t be sad about not wearing it for a while! Oh it’s great! I love the wishbone and it looks very nice on you. Indeed, you will need to set that aside for the first fall breezes though. First of all, I think you’re very brave to model your sweater in the heat of summer! And second of all, what a GREAT sweater. That does look like the type of perfect, wear-all-the-time sweatshirt-y kind of sweater I love best. I’m tempted . . . but I think I’ll wait for cooler weather! So clever, both you and EZ. The sweater is an engineering masterpiece. I predict this will be a go to summer come appropriate weather.